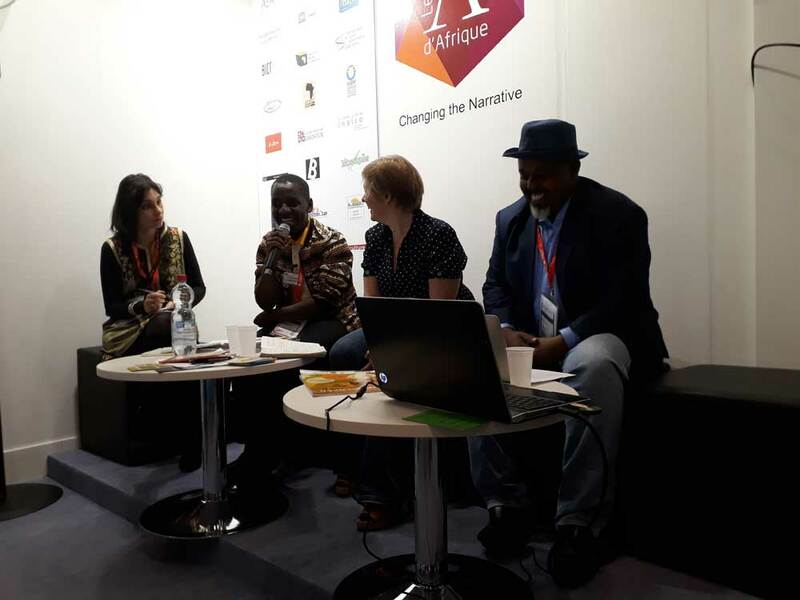 “Rights in African Languages: Promoting networks and exchanges to facilitating trade” was a topic of discussion at the African pavilion at the Frankfurt Book Fair 2018 on October 11, 2018. The panel moderated by Nathalie Carré featured Eric Dusabimana, Dr Kenza Sefrioui, and Dr Jama Musse Jama. Rights for languages are an important aspect of the publishing business as a book available in a new language can mean a new lease of life for it. Those who had convened the African pavilion were aware of this so they would get speakers to share their experiences on this important topic with Inalco’s Nathalie Carré being their moderator. Her panellists included Bakame Publishers’ Eric Dusabimana, En Toutes Lettres Publishing’s Dr Kenza Sefrioui, and Hargeysa International Book Fair founder Dr Jama Musse Jama. Our moderator Nathalie Carré started the session asking the panellists, to our shock and consternation, what African languages were; whether they had to be from the continent or some were from out of our rock. Their responses were quite decent if you consider that panellists are still being asked this lame question in 2018. Away from that question bombshell, they would share their experiences with the audience. Here are some notes from the three speakers. Eric Dusabimana who works out of Kigali, Rwanda spoke about the challenges of publishers as populations in some countries do not see books as a priority. Publishers themselves are very “money minded” and would do everything with the mind-set of making immediate returns from each of their actions. He gave the example of the Rwandan experiment with the Kigali International Book Fair which ran in 2013 and had disappointing numbers of customers coming through. While the numbers were low, publishers never took the opportunity to do deals at their event but were more worried about the losses. On the part of Bakame Publishers, they chose to write in Kinyarwanda as they wanted stories from their people for their people. They would then translate to English and French so that they communicate with the rest of the world. They were happy to sell translation rights and they were open for negotiations. On the books that they got from outside the country they translated them into Kinyarwanda using the Rwanda context which was popular for readers in their country. Dr Sefrioui who represented EnToutes Lettres Publishing would bring another angle to this discussion as she had the Moroccan experience. The country had its own internal language politics with heated discussions on the proper form of Arabic to deal in, local languages, and the place of French and English. Her firm had produced the essay collection Maroc and la guerre des langues (Morocco and the language war) which brought many different opinions on this topic. She explained that there were very few books which were being translated in her country – about 400 annually. The books in their market tended to come from France as well as from Egypt and Lebanon. Her firm had started a project supported by institutions like the National Centre of Books France, the French Institut which helped them translate small books that can be easily accessed by readers. In spite of the support, there were issues with uptake as their production process meant the cost of the books were higher than what is currently available in the market. Even with this, they have made decent sales of their books. There is a need to find more translators who are specialised in different types of work away from just fiction; here she was talking about translators for technical books. Where building networks were concerned, there was a need to build them with people who could help the process along. This was not the case in Morocco where two large bodies were battling to be the person who the outside world would have to deal with to access the North African country without helping those who are within the system. She was also worried that we had already lost the digital battle as the technologies that we were using like Google and Amazon were not Moroccan or African and to use them we had to do it on their terms. Dr Jama saw language more as a tool to achieve his ends which is reaching the human being. For him, countries had to be interested in art and culture or they are going nowhere. This is because while countries like Somaliland, which had come from the post conflict situations, were keen on building infrastructure they would forget to invest in art and culture which targets the individual. Where translations were concerned, their method was unique especially when translating Somali poetry into English. Instead of translating them directly they would give the poem idea to a poet who would then write a new one in English conveying the same message. Apart from translating books, he felt there was a big problem with the mentality in the publishing industry. He wondered aloud how he could get a book which came from Frankfurt or London within 48 hours but would have a problem getting books from closer destinations like Nairobi which is a one hour flight away. He also spoke about the Hargeysa International Book Fair and how the work allowed them to network with other countries across the continent. This networks allowed them to set up a new festival called the African Book Festival. Next Next post: Jennifer Nansubuga Makumbi is Commonwealth Short Story Prize 2019 judge.